Alpha 54 can probably be summarized as heavy polish on the visuals and lot's of new enemy ship types. Not to mention you can change your ship at any point in the game, if you have two crystals available! Added a lot more detail to the star backgrounds. Randomly selecting a background texture, which will also show at a random angle. And three separate parallax layers to give that feeling of depth. Added new Keyboard and Mouse controls and after various tweaks and fiddling with values I think I've got the feel just right. These give the player a lot more control compared to the Touch based ones, which I'll keep around for people who want to use it instead for whatever reason. Added a way to change your ship type ingame, by default it requires two crystals. Which will be consumed when you change the ship. At the bottom right on the HUD there is a new ship statistics sprite, you can scroll through the ship types using the KBshiptype key (default c). You have to press and hold for about half a second to confirm your choice. 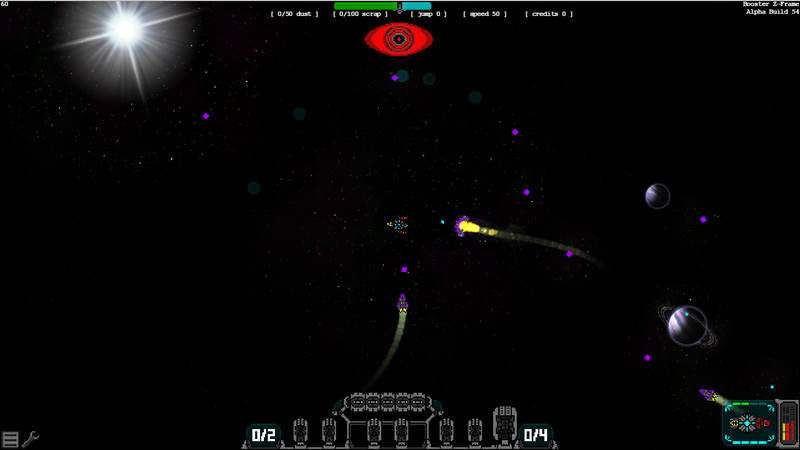 Added a shield effect and deflection sound on the purple faction ships. Added an on spawn angle, enemy ships will now angle towards the player ship when spawning. Changed the Hyperspace opening sequence, the countdown won't start immediately after pressing the Hyperspace button. The Hyperspace start sound has been lengthened a bit to compensate for the delay. Changed the layout size from 3600x3600 to 6400x6400. This extra space gives the spawner a bit more room to work with to spawn bigger objects like stars and black holes. This probably fixed an issue with the initial scan log not being able to detect one of the bigger objects, simply because it was still waiting for room to spawn. Changed black holes, they now attract you from anywhere in the sector. This force gets stronger the closer you get to it and has a point of no return around the event horizon. Changed the offscreen angle towards player behavior of enemy ships. When the player is detected the enemy ships will gradually rotate towards the player's position, instead of instantly setting their angle. This negates the strange looking instant flip which happened when going offscreen. Fixed a bug when a the black hole spawner was set to spawn black holes before the allowed WorldNum, while not actually being able to spawn them. Causing a potential star or enemy ships to not spawn either. Ending up with a rather empty sector. Fixed an issue with turrets blowing up on ships, causing spawned bullets to shrink down to 0x0 pixels.